Specifies the font color of a presentation element. colorObj = FontColor() creates a black font color object. colorObj = FontColor(color) creates a font color object based on the specified CSS color name. Hexadecimal RGB (red, green, blue) color value. Use the format #RRGGBB. Use # as the first character and two-digit hexadecimal numbers each for the red, green, and blue values. For example, '#0000ff' specifies blue. 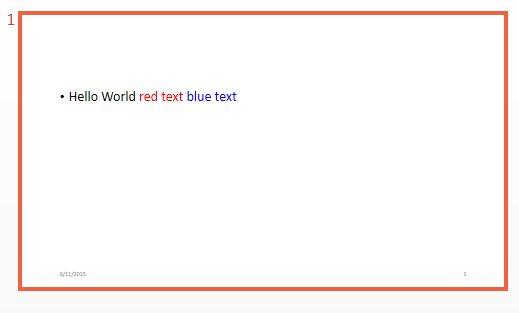 Font color for presentation element, returned as an mlreportgen.ppt.FontColor object. This read-only property specifies a hexadecimal RGB color value. For example, '#8b008b' specifies dark magenta. You can use either uppercase or lowercase letters as part of a hexadecimal value. To specify a hexadecimal RGB format, use # as the first character and two-digit hexadecimal numbers for each the red, green, and blue value. For example, '#0000ff' specifies blue. Create a paragraph and append text with colored text.